Mother Nature has been wreaking havoc all across North America this week and I can't go thirty minutes without thinking about how people were being affected. Seeing a video of a guy throwing a cup of hot water into the air and it instantly turning into powder was mind-blowing. And hearing about water pipes freezing and bursting was heart-breaking. I truly hope all of you who were caught in up in her winter shenanigans were able to stay safe. The Bay Area managed to avoid her freezing temperatures, but we were hit with some showers which caused me to miss my first planned flea market trip of 2019. That's okay though. We can always use the rain and I can use the spare time to clean and organize my office which is completely cluttered with cardboard. 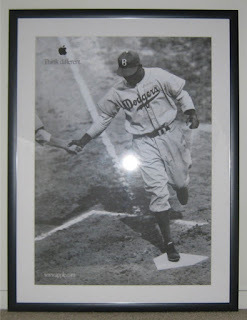 This is my most recent Jackie Robinson acquisition and in regards to memorabilia cards, it's my favorite. I enjoy the simplicity of the card's design. The beige lines that run up and down the card goes well with the off-white swatch of jersey and the sepia toned photo. If I were a baseball card museum curator, I'd make sure this card was prominently featured. It's way too beautiful to not get special treatment. I had a really hard time narrowing down my Top 3 selections, because they're all in a league of their own. When you walk into my townhouse this poster is one of the first things people see. I've been an Apple guy since the early 80's and I've collected their Think Different posters since the late 90's. This item combines two passions. This poster was a gift given to me from one of my students. It was originally her Black History Month project, but after she received her grade... she told me I could keep it since I spoke so highly of Mr. Robinson. This poster has been hanging up in my office the past six years. This card is my favorite card in the collection. Much like the 2010 Topps Chicle, it's a thing of beauty. 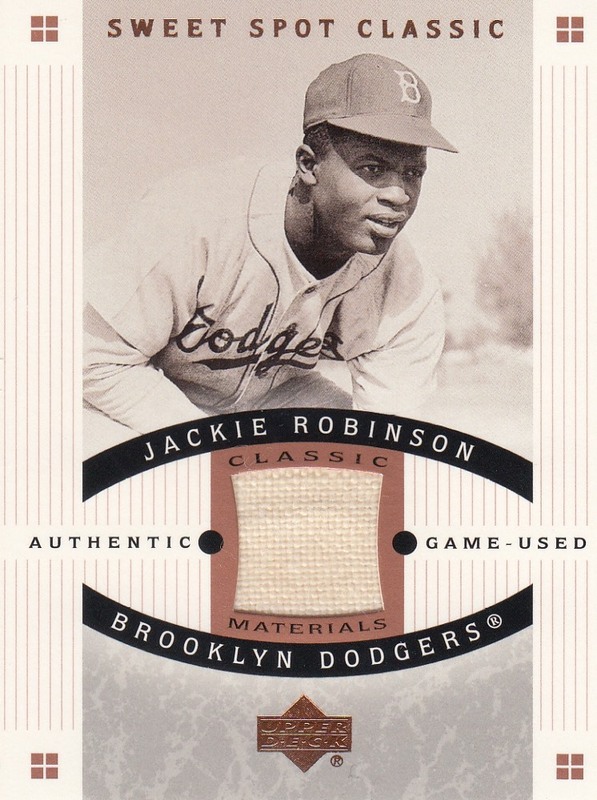 What's your favorite Jackie Robinson collectible? Well that's it for today. It's time to head into my office and start cleaning. 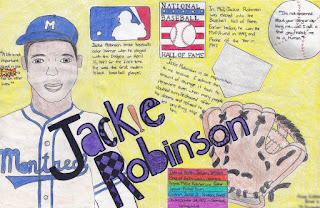 Happy 100th birthday Mr. Robinson! Whenever I think of "courage" and "perseverance", you're one of the first people that come to mind. As a longtime baseball fan, I am truly grateful for your contributions to the game. I would love a jersey card, but if it is a card I own, it would have to be his 2001 Topps Archives ‘52 Topps reprint. I love the ‘56 you have as well as the jersey card. Hopefully you can add an autograph and rookie to complete the trifecta. I have to agree with you, the 1956 Topps card is my favorite Jackie Robinson Card in my collection. I have a few reprint cards of his, but no vintage. My favorite is a dual jersey relic with Roberto Clemente. I haven't got any Jackie R cards except for the 2018 Stadium Club one. Wouldn't mind one from his playing days but I don't see that happening! Your top 5 are awesome. 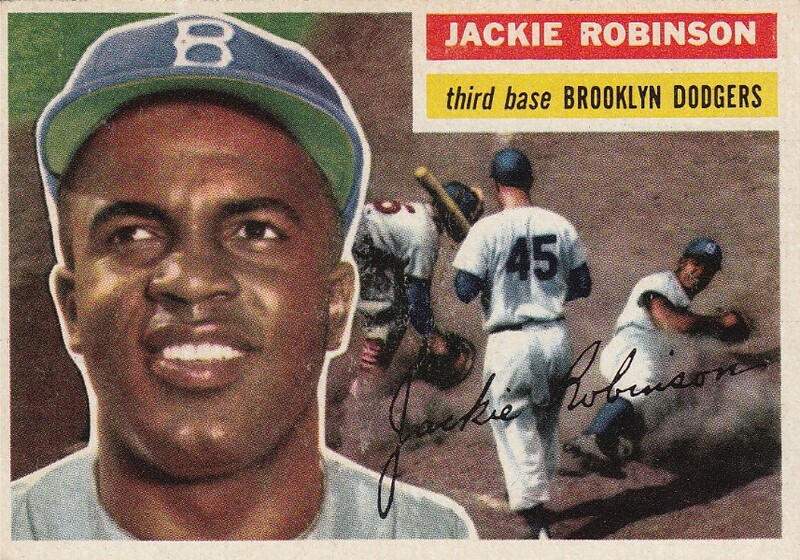 My favorite Jackie R card is my 1955. It's really my only career-era example. Without a shadow of a doubt my favorite art is student gift art. When I cleaned out my office at school last December the only real things of value to me were the pieces given to me by kids thru the years. I never have had the heart to let go of them. I think the student poster is amazing. Glad to hear you still have it hanging up. 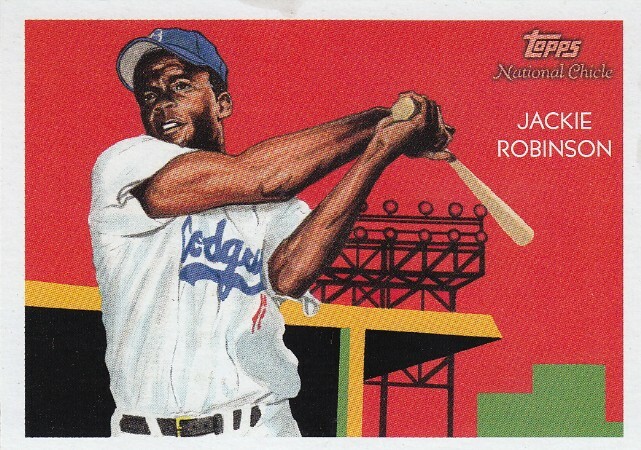 I don't collect Jackie Robinson, but his rookie card has to be his most iconic for sure. brian - it's such a beautiful card. i look for ever opportunity i can to show it off on this blog. collecting cutch - the 56 is my only vintage card of #42. as for the clemente/robinson dual... that's fantastic. peter k steinberg - jackie has some awesome stadium club photographs. that includes his 2018 card. angus - thanks. i really need to think about getting it framed. sumomenkoman - it's definitely on my wantlist... but doubt i'll ever actually own it. That Black History Month project is amazing! What a great gift! I agree, the 56 is my favorite card of his in your collection. Man, that stuff is amazing. If I made about twice what I do now I would probably try to get into collecting Jackie. I have not dabbled much in Jackie Robinson cards, but I need to fix that at some point. That project your student made looks great. Love the Montreal Royals uniform on the card. Matt - Yeah. I haven't done it in a few years. I've replaced it with a unit where they make trading cards of their favorite Civil Rights leaders. Community Gum - I don't pick up new Jackie collectibles very often. That jersey card was the first relic I've grabbed in quite some time. Snorting Bull - Yeah. It really is a great one of a kind collectible. Thanks. My favorite card in the collection and it's not even close.